The revolutionary Crystal Clear COMCIT anti-ageing facial treatment machine is the first of its kind in the world and the results are instant, defying the ageing process for both men and women. 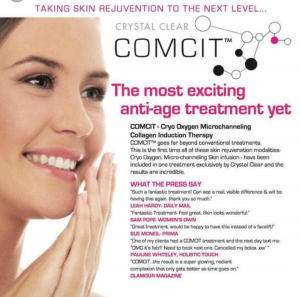 The COMCIT goes beyond all conventional anti-ageing treatments. For the very first time all of the following proven skin rejuvenation modalities have been combined into one incredible treatment. Cryo-Oxygen – Deeply oxygenates the skin. Microchannelling Roller – Creates thousands of microscopic channels in the skin, stimulating collagen & creating instant pathways for product infusion. Product Infusion – Floods the deeper layers of the skin with active anti-ageing ingredients such as Hyaluronic Acid, Peptides and Vitamin C.
Jet Oxygen – Soothes and restructures the skin. Discover red carpet results with an H2O Glow treatment. Known internationally as the ‘Instagram Facial’ because of the perfect photo-finish it achieves. Cryo-oxygen is pulsed into the skin, which is then micro-channelled and hyaluronic acid, peptides and stem cells are flooded down these channels. Jet oxygen is then used to lift and plump the skin. The treatment is finished with application of the legendary mini-lift mask. The result is firmed, brighter, fresher, hydrated skin that glows. For tackling lines, wrinkles and pigmentation. Cryo-oxygen is pulsed into the skin, which is then expertly micro-channelled, concentrating on all areas of concern. Specifically chosen infusions are flooded down these deep channels targeting lines, wrinkles, laxity and pigmentation. Treatment is finished with a further pulsing of cryo-oxygen and application of repair mask to soothe and nourish the skin. Single treatments are available but for best results we recommend a 3 month treatment programme. This would involve you enjoying a treatment every fortnight with the micro-channelling going progressively deeper each time to achieve remarkable clinical results. Oxygen therapy is an intense anti-ageing treatment that plumps the skin from the inside out. This is a sophisticated and clinically proven treatment that delivers pulsed oxygen and skin restructuring actives where skin health, elasticity and firmness begin. The result is dramatically rejuvenated, hydrated skin with visibly reduced lines and wrinkles. It is also very suitable to calm and soothe reddened or sensitive skin. Oxygen therapy does not involve any skin needling at all. This treatment is finished with application of the legendary mini-lift mask. Results are immediate, you will notice the difference after your very first treatment. Your skin will be beautifully plumped and feel firmer. The result will get better and better as new collagen production is kick-started around day 4. 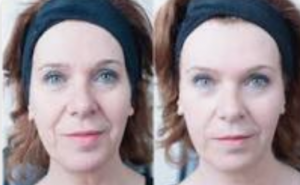 For the ultimate rejuvenation we recommend a course of 6 treatments, taken 2 weeks apart. Why do I need to wait 2 weeks for another treatment? It takes between 4 – 14 days for your fibroblast cells to lay down new collagen. At day 14 we can stimulate the repairing and restructuring process again. Yes, COMCIT™ is an extremely safe, bloodless treatment and due to the Cryo Oxygen Therapy elements of the COMCIT™ treatment, it is completely pain free. Do I need to use any specific products in between? Can I wear makeup afterwards? After an H20 Glow Treatment? Yes. After a Frozen Facial Treatment? Please wait 12 hours. Can COMCIT be used on any skin type or colour? What will COMCIT do to my skin?